In a rebuttal published 24 February in SvD, Swedish lawyers Thomas Olsson and Per E Samuelson set the record straight about the actual feasibility of an interrogation of Assange in London. “We are forced to summarize that the prosecutor, by doing nothing, violates the expeditious-requirement according to the Swedish law”, the lawyers stated. 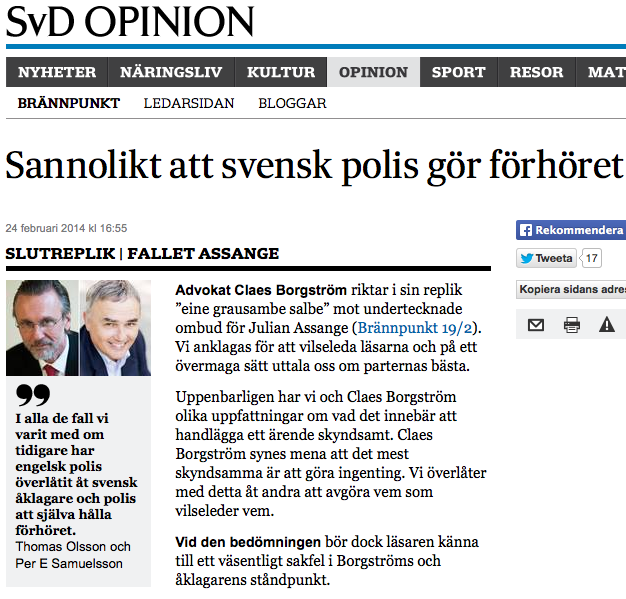 Lawyer Claes Borgström aimed his “eine grausabe salbe” against us, the lawyers of Julian Assange [See Brännpunkt 19/2] . We are accused of misleading the readers, and of expressing ourselves presumptuously on what is best for the parties’ interests. Apparently, Claes Borgström and we have a different understanding on what it means to deal with a case expeditiously. Claes Borgström seems to suggest that the most expeditious is to do nothing. We leave to others to resolve who misleads whom. Thou in assessing that, the reader should be aware of a significant factual error in the prosecutor’s and Borgström’s stance. Borgström states, “An interrogation with Assange at the Ecuadorian embassy is to be conducted by English police officers that has previously received communication from their Swedish colleagues about which questions will be asked”. This is incorrect. The British authorities decide how the hearing is to be performed. However, in all the cases we have previously participated, the English police have left it to the Swedish prosecutors and police themselves holding the hearing, just as if it had taken place in Sweden. So it will surely be also in this case. Nor is there any constraint about what questions may be asked. During a hearing in London, the Swedish police and the prosecutor are free to ask any questions they want. Assange will answer them all. We are forced to summarize that the prosecutor, by doing nothing, violates the expeditious-requirement according to the Swedish law; she hides behind false claims regarding how a hearing in London would be performed, and thus pursuing with a discriminatory treatment negative to Assange. According to Borgström, we should not express an opinion on whether the above benefits the plaintiffs. However, we believe, honestly and sincerely, that all the involved benefit from that the preliminary investigation is driven forward, which can only happen if the interrogation with Assange is carried out in London as soon as possible . *It would mean literally, ”It is likely that the Swedish police do the interrogation”.